Time to call the pros?For major renovations, professional cleaners can be called in, as clean-up may be too extensive and taxing to do on your own. If you had your renovation done on a home you are already living in, you would have already had furniture and soft furnishings. Mattresses, sofas, carpets, and curtains – even if you had covered them in plastic or newspaper – will need a thorough clean as these often accumulate dust that may cause respiratory problems like asthma or rhinitis. Contrasting geometric patterns – rectangular subway tiles for the walls against octagonal floor tiles – lend visual drama to the monochromatic master bathroom. 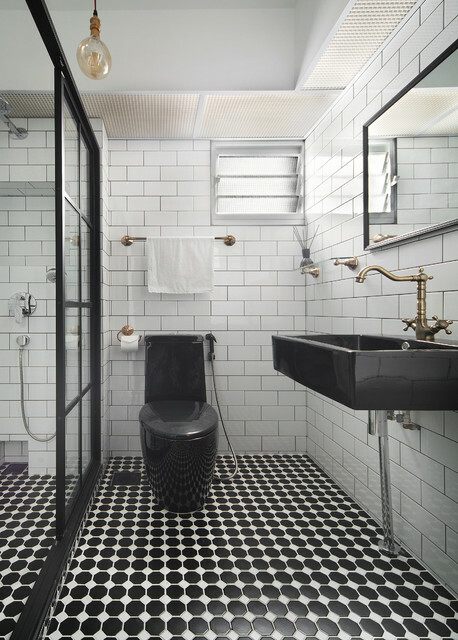 Get the look:For a steampunk industrial bathroom, go for white subway tiles and a black-and-white floor. Use exposed metal fixtures and a black-framed shower cubicle to get that industrial edge.